Kellogg Co. says it will work with suppliers to reduce greenhouse gases and promote sustainability. Two weeks after rival cereal maker General Mills, Kellogg's says it, too, wants to help save the environment. The company that makes Corn Flakes, Eggo Waffles and Pop Tarts says it's committed to "doing what's best for people and the planet." Among its initiatives are to "responsibly source" its top 10 ingredients and materials by 2020, and take steps to ensure that suppliers are abiding by sustainability rules by next year. General Mills (GIS), which makes Cheerios and other popular breakfast foods, unveiled its sustainability policies on July 29. At that time, when pressed by reporters about what it was doing, Kellogg's (K) said it was working on a number of environmental initiatives. "We're making progress but also recognize the need to drive change, which is why we're stepping up our plans now with new goals for 2020," said Diane Holdorf, Kellogg's chief sustainability officer, in a statement Wednesday about the company policy. 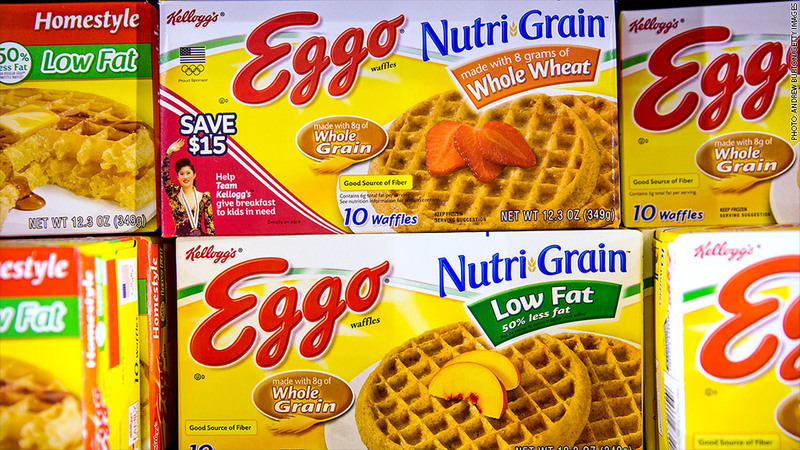 The company pointed to its Eggo Waffle factory in San Jose, Calif., as an example of how it is already taking steps to improve efficiency. The Eggo factory recently installed "fuel cell technology" that supplies half of its annual energy needs and consumes less water than it would if it were connected to the energy grid.